There’s always a pack of lentils in my kitchen cupboards. Sometimes more than one; the quick cooking red variety to throw into soups, the big fat yellow ones for making dahl and the more elegant puy for making a wholesome side dish or salad. 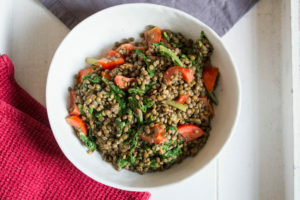 The mealy, earthy taste and texture that comes from a lentil is part of its charm; the fact that they are so humble but so versatile and filling is why I always find myself with lentils on my plate at least once a week. 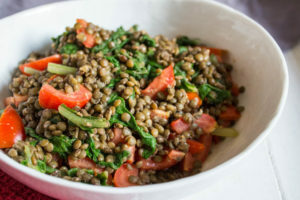 This dish of lentils and chard was served alongside some simply griddled chicken but it was so good that I think it’s perfect as a meal on its own. Start by getting a large pan of water on to boil. Add the vegetable stock powder and the lentils to the boiling water and cook according to packet instructions. Lentil cooking time is so variable I recommend checking them regularly. While the lentils cook remove the stalks from the chard leaves and divide the stalks and leaves into two piles. Chop off the woody ends of the stalks and discard them, chop the rest of the stalks into one inch lengths. Roughly chop up the chard leaves. Get a frying pan on a medium heat and add the chard stalks and leaves so that they both wilt. The water that comes out of the chard leaves will help to steam the stalks. Once everything is wilted remove from the heat and put into a serving bowl. Add the tomatoes to the chard along with the garlic, the juice from the lemon, the balsamic and the olive oil. Add a little salt and plenty of pepper and mix everything together well. Once the lentils are cooked, drain them well then add them to everything else in the serving bowl. Give everything one final mix together before serving. I have since tried this dish with kale and topped it with a poached egg. It was heaven. A few scraggly odds and ends from various corners of the kitchen are all brought together in a bowl of green lusciousness which is full of goodness and vegetables. You could try adding a few spices; I think caraway or fennel would work really well or maybe a finely sliced chilli and a hint of ginger. 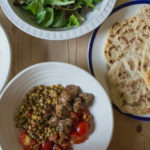 If you have lentils in your kitchen, you are never far from dinner. We seem to share the same love for lentils. I always have a few packs of different kinds of lentils in the cupboard. 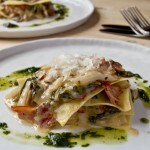 This looks filling, delicious and GOOD for you too. Yours is the second lentil post I’ve drooled over today. Need to check my pantry and start a batch!!! YUM! Hi Caroline, I am a huge fan of lentils as well, love this dish. I bet it taste amazing! I too always have a bag or two of the ready to eat lentils in my cupboard they are so versatile and great when you need dinner in a hurry! This dish looks great.